Online learning is one of the fastest-growing segments in education and training. According to the 2015 Survey of Online Learning, almost 30 percent of students now enroll in at least one online education course. That makes for a total of almost six million online students. Working adults who seek online education opportunities have different needs than typical college students. Deploy these four tactics in your eLearning program enrollment marketing to enhance recruiting and retention among those adult learners. Have you ever sat in a meeting where a presenter kept talking about the market potential of their idea? It’s easy to fall into the same trap when setting objectives for your online enrollment. Avoid making projections based on market potential. Instead, focus on achievable goals that bring steady improvement. You’ll get more predictable results. That, in turn, makes it easier to set budgets and make changes as the course develops. Set a welcoming, informative and approachable tone straight from the start. Be as responsive and engaged as possible with your students. Use analytics to identify which types of engagement students respond to the most. Even if you don’t have enough time for deep, one-on-one engagement with everybody, this will help you get the most return out of your effort. 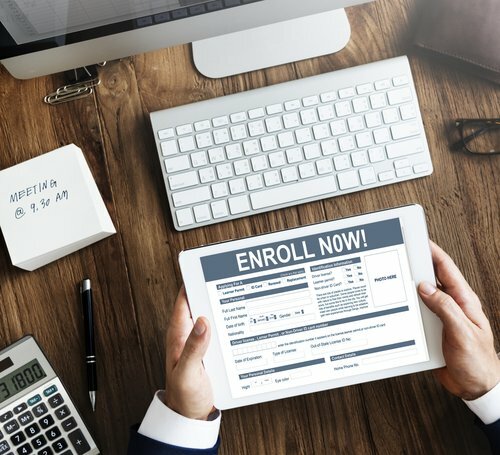 Develop unique content marketing for each stage of the enrollment funnel: initial interest, application, admission and sign up/deposit. Each piece of content should be designed to move prospects to the next stage of the funnel. Encourage prospects to engage your team in conversation via email, text or on the phone. Go beyond the traditional marketing methods to delight and amaze prospective students. Predictive modeling means analyzing all the data on students who may be interested in your online course offerings. You can then use that data to determine which students will sign on. Look at information such as where current students come from, what educational background they have, test scores, demographics and psychographics. Predictive modeling is useful because marketing to people who will not enroll is very expensive. Anything you can do to put the recruiting and retention edge in your favor is beneficial.